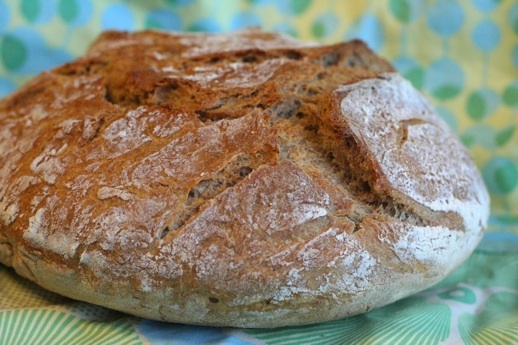 I love baking bread – from scratch and by hand. I grew up with an artistic father (30 years in photo journalism in Chicago with half that covering Food and Fashion around the world) who developed a deep love of bread baking when I was young and had the distinct pleasure of watching him create incredible loaves -everything from a rich pungent potato bread (still my favorite) to zesty and fun pizza loaves. It took a surprising amount of will to actually begin making bread myself several years ago – somehow it was always “Dad’s” thing. And then there was the real fear of botching it. Strange how such a simple and ancient thing -something that has been a part of human history since the dawn of agriculture- has become so mysterious and aloof. For years I have made bread following either James Beard’s (Beard on Bread) and especially Daniel Leader’s (Bread Alone) advice and have made some incredible creations with their help. But (the new) “Dad’s” bread is still a luxury, with much of our sandwich bread coming from the store. Leader’s artisan recipes can take literally days to make -and are worth it!- but with all the irons I have in the fire it is unusual if I make more than a loaf a month. I believe that the simpler, or whole, the food the higher the food value. Even organic breads have unpronounceable ingredients, and there are no local bakeries here in rural Jefferson County. Last year I had experimented with the NY Times No Knead Bread as a means to make bread more expeditiously and was impressed but had fallen out of habit. With the cost cutting measures as we tighten our belts I started making it again. All home bread is cheaper (between $1-2/loaf) than store bought organic whole grains ($4-7) and it super fun to make with kids. Yesterday was my true test. Could I make a bold, light loaf of “artisan” bread while working a 13 hour day? Yep! If you read the recipe you will notice that the first steps take under 5 minutes. I did it while the coffee brewed. I wake up at 3:30 to allow me to get to work by 5am and I like to read a bit to settle my mind prior to work (my coworkers think I am insane – which may be true). That means that I can let the dough rise for over 14 hours by the time I am home again and settled. Step 3 entails scraping the now incedibly light and risen “sponge” onto a floured counter and kneading it about 30 seconds to deflate it and to form a ball. My 7 yr old did it last night. Then let it “proof” for 2 hours and 90 minutes in heat the oven to 450 degrees. Yes that hot! 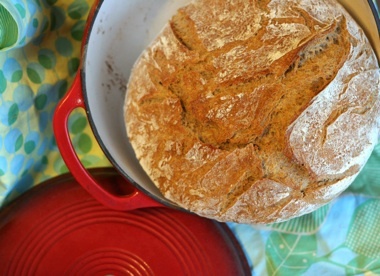 Here is the kicker that keeps alot of people from making the No Knead Bread – you need a dutch oven. You can use a pyrex or cornell caserole pot too, it just needs to be covered and be able to withstand 450 F. I spent $45 on a Lodge Enamel Cast Iron dutch oven I didn’t get the top of the line which meant I had to take off the plastic lid knob (only good to 400 degrees?!) and make one myself out of some bolts and washers. It works great and makes a wicked chili too. Put the Dutch Oven into the real oven while you preheat it to 450. When the dough is ready just remove the D.Oven (use THICK mits!) and flop the dough in “crease” side up. Cover the D.Oven again and return it to he oven and finish cooking per the recipe. My D. Oven is rather large (6 Qts), so I get deeper loaves by doubling the NY recipe and adding 7-10 minutes to the covered cooking time. The greatest thing about the No Knead Bread is that you can keep the dough INCREDIBLY light because you do not need to ad too much flour to make it “workable”. That means that the texture, or “crumb” is very airy. This is more like a white flour sourdough than the 50% wheat flour mix it really is. Makes fabulous toast and pairs well with potato soups. I am still in disbelief that bread of this quality, flavor, and nutrition (no fat!) is possible while also working long days and making dinners from scratch. And the kicker is that almost every loaf turns out this well – the typical variables like kneading vigor and having to rigorously follow the timelines of letting various rising stages of traditional bread are not present in this recipe. It is really this simple. I was a skeptic years ago, and then I watched this video and became enough of a believer that I bought a $50 pot. It works. Its incredily easy. Its uber cheap (ROI is like 12 loaves). And oh, the FLAVOR! Not to mention the nutrition -add some flax meal for Omega’s, throw in some wheat germ for protein, and experiment with whole wheat, rye, amaranth, and quinoa (just reduce the flour = to what you add), dashes of herbs add flavor and depth. Your family will be better for it! You can do this. 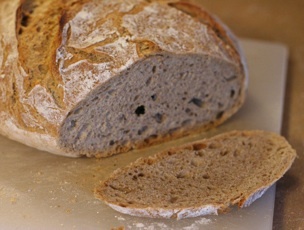 Start it the night before on a Friday and have fresh bread for an incredible lunch with soup on Saturday. So if you have followed the previous several posts you will be aware that I am struggling with my former belief that eating local organic vegetables was the most ecological way to receive sustenance. I no longer think that is true. Perennial pastures build soil fertility, lock carbon in the soil, and grass fed meat can be raised with virtually no petroleum inputs. But I also think that the difference between eating whole, local produce exclusively and getting a percentage of your calories from grass fed meat is very small. If I had to make an unscientific spectrum from least ecological to most, I would have CAFO meat (and if it doesn’t say 100% Grass Fed-it’s almost certainly spent at least some time in a CAFO) and processed foods (if you have to open it- it counts [processing adds another factor of 10 to the embodied energy]), then imported fruits (typically flown in), to processed organic foods, then a huge jump up in eco-friendliness to regional Organic Produce in season, local produce, then local organic foods and finishing with Grass Fed Meats. Further more, raising animals on an integrated farm actually makes local organic produce more ecological by producing the fertilizer on site. Plus animals add enough profitability to actually make a livable farm-only income feasible for a thrifty family. Sustaining a populated rural countryside is very important for biodiversity and our ability to produce our own food as a nation. Supporting these enterprises is a patriotic as well as ecological act. Potentially graphic content warning-but if you want to eat meat you need to know this: Readers of Michael Pollan will find this familiar. When the cows are led into the slaughterhouse, they are sent through a chute that has them enter single file. Each cow is then killed by a piston shot into their forehead. When it works, it really isn’t too bad a way to go in my book: brain dead within seconds. But the piston misses. A lot. Because of McDonald’s there are now inspectors watching as the now dead cows are strung up for processing. It is typical that they shake around as their nerves fire, but these are not still alive. However, some of the cows will be visibly trying to get upright again. Those cows aren’t even stunned and they head in to the processing, which starts with skinning, very much alive. McDonald’s standards are maximum 5% still alive. That is about 1 out every 20 cows, and I refuse to support that industry. Though I do not find eating meat immoral, I find immense problems with torturing animals in our care. Therefore I do not eat beef. Chickens are not as regulated and it is feasible to find local grass fed chicken. I can think of three farms off the top of my head within 10 miles where I could drive up to their door and buy a humanely slaughtered chicken. So why am I not doing it? Frankly, I am not sure if even I know why. Perhaps after all these years I find animal carcasses distasteful. Perhaps I am lying to myself and I do have an ethical issue with eating meat. Maybe it is just culinary inertia. But I do think that there is enough reason that given our current situation we have the means to eat vegetarian so we will continue to do so. I guess it is best summed up that I can think of no reason to start eating meat in our current lives. I also know that if we move out onto a farmette, we will need to keep animals to build soil fertility. At that point I will eat meat-animals will be necessary in our lives and I will personally be able to oversee their ends ensuring a quick, clean death solving most of my concerns. This is still untidy in my mind, which bothers me, but that is where I am right now. Gene Logdson’s The Contrary Farmer and All Flesh is Grass. Gene is a cool guy. Joel Salatin’s books are designed for those wanting to farm, but he is a blast to read. And those interested in ethical eating shold check out Michael Pollan’s Omnivore’s Dilemma. The book is great, but he gives Whole Foods a raw deal. Remember-eating is a political, ethical, and ecological act.